Vitamin D-3 5000 IU 250 caps. Take 1 softgel daily with a meal and water. 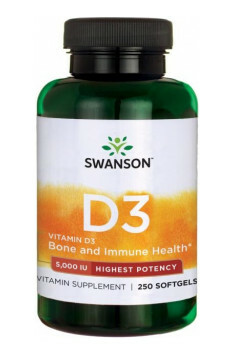 As vitamin D has a long half-life and can be stored in the organism, it is best to take the recommended dose, for example, every other day or once a week. Apart from that, it is believed that a single dose should not exceed 6,000 IU. According to data by EFSA on vitamin D dosage, its safe daily dosage for adults is about 4,000 IU (2 capsules), while higher values (even up to 10,000 IU daily) are advised in the case of, for example, pathological obesity or malabsorption. Vitamin D is a fat-soluble compound, so in order to achieve maximum absorption, take it with a high-fat meal.